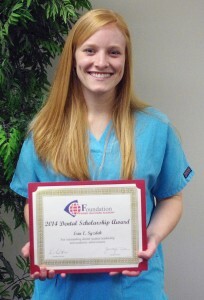 Southern Illinois University School of Dental Medicine student Erin Syzdek has received the 2014 Foundation of the Pierre Fauchard Academy (PFA) Scholarship. The Palatine native is a third year student. The $1,000 award recognizes a dental student who has demonstrated great potential for developing into an outstanding leader in the profession and in the community. The recipient is also expected to exemplify the qualities of integrity, imagination and initiative as well as display good communication skills. “Erin has served the School remarkably well as Student Council president,” said Dr. Bruce Rotter, dean of the SDM. “Her commitment and dedication to the position have earned her a second term, as she was recently re-elected by her peers to serve as president for another year. The Pierre Fauchard Academy is an international honorary dental organization. Its mission is to consistently focus on professionalism, integrity, and ethics worldwide, by dentists’ own conduct as worthy role models, by the advancement of dentistry to the highest level, by supporting and honoring colleagues for their distinguished work, research, contributions, and public service, and by providing excellence in programs, education, and leadership in oral health care. Photo: SIU School of Dental Medicine student Erin Syzdek with her Pierre Fauchad Academy award.